Falling from grace, or rather– losing my place..
After a rather fitful night of very few hours of sleep I just now awoke with the realization I’ve spent my entire life attempting to work my way into being the number one love of someone’s life. At the age of 38, when I married Brian, I did so with the belief that I had, at last, finally connected with someone who loved me enough that I was number one in his life. This was truly a first for me. I was born to a mother who clearly favored my older brother; her firstborn child. I spent my entire childhood trying to be the good child and mommy’s helper and right hand in an attempt to win favor in my mother’s eyes. I was the second of my mother’s eight children so there was much competition, and in my family of origin competition is what is was and still is all about. In my teen years, as my older brother rebelled and I became my mother’s confidant, I finally began to feel I’d won some favor. Those teen years, however, would also be when I went full on in my quest to try and earn the love of a man. Despite the fact my early years began with the favor of my dad’s eye, any positive that could perhaps have come from that was strongly countered by the harsh physical abuse I, as well as my older brother, suffered, at his hand. My first serious boyfriend was a 17 year old to my 14 years. It was his best friend who really liked me, but as would become my established pattern, I didn’t “like” the guys who actually really liked me. I now understand the reason being to do so didn’t fit my agenda; as my agenda was to try and win the love I didn’t receive from my primary caretakers. So, rather than accept the love of the boy who was crazy about me, I spent my time trying to win favor from the one who wasn’t pursuing me. Within a short period of time I did win his favor and we began dating. At first it felt great. But after three months of being used for his pleasure I found I felt empty. Despite his initial verbal manifestations of love, no sooner did I tell him I wanted to also see other people (I was only fourteen after all) he promptly had some floozy in his bed giving him what he’d been hounding me for. She wasn’t his first and most certainly not his last. What really hurt me was the harsh, painful and swift rejection. In reality, which perhaps I sensed all along, by him I was not loved. I spent my freshman year grieving. I thought it was over that guy, but as an adult I realize the roots of my grief went much deeper than the end of that romantic relationship. It was during my freshman year that I met the boy who is now the man I’m married to. As a girl, I was initially attracted to him but my interest quickly waned. Likely because he actually liked me, and because my heart was not really open to love—much as I longed for it. I spent the next few years replaying, over and over again, the same theme– meeting and becoming attracted to a guy who refused to love me. Some dated me briefly, some not at all. If I met someone who actually wanted to love me I either rejected him immediately or found fault in the relationship and moved on. The first man I married seemed to like me a lot, initially. After a month of dating each other, true to fashion of the primary culture in which I belonged, we were engaged to be married within a month of meeting. However, as soon as he proposed he wanted to back out. By this time I was becoming frantic for my want to be wanted and loved. It would seem he fit the bill perfectly because, clearly, he didn’t really love me and didn’t really want to. Despite all, we ended up married two months later. It was one of the biggest mistakes of my life, and yet, at the same time, it fit my unconscious agenda perfectly. I spent the next seventeen years fighting for the love of a man who made it clear he really didn’t love me. I suffered miserably but comfortably as a second rate citizen in his life until, finally, I’d grown enough within myself that I chose to no longer suffer in such a way. Somehow, I believed, I’d come to love myself enough that I didn’t need to suffer in a loveless relationship. I thought I loved myself enough that, if need be, I could spend the rest of my life single and be okay with that. Shortly after leaving that painful marriage relationship my path crossed with Brian’s. Brian had been single for several years after being left by his first wife. He was afraid to open his heart again but, it seems, I was worth taking a chance on love for. I think I loved Brian as much because he loved me as I loved him for him. And then a year and a half later I got pregnant. And then his first child was born. And she was born with a genetic birth defect. But she was and is beautiful in our eyes. And she has been so loved by us from the very beginning. And she is her daddy’s one and only child whom he has been truly devoted to all along. Eleven years ago I had plans for my life; plans that did not include being primary caretaker and devoted homemaker with yet another child. But because I was pregnant with this child I changed my plans and got my mind wrapped around the idea of full time motherhood again. At the time I took comfort in the belief that my child would become independent; first going off to kindergarten and eventually graduating high school. Thus it was I experienced this unexpected midlife pregnancy with a vision that soon enough there would be time, again, for me and my personal aspirations. 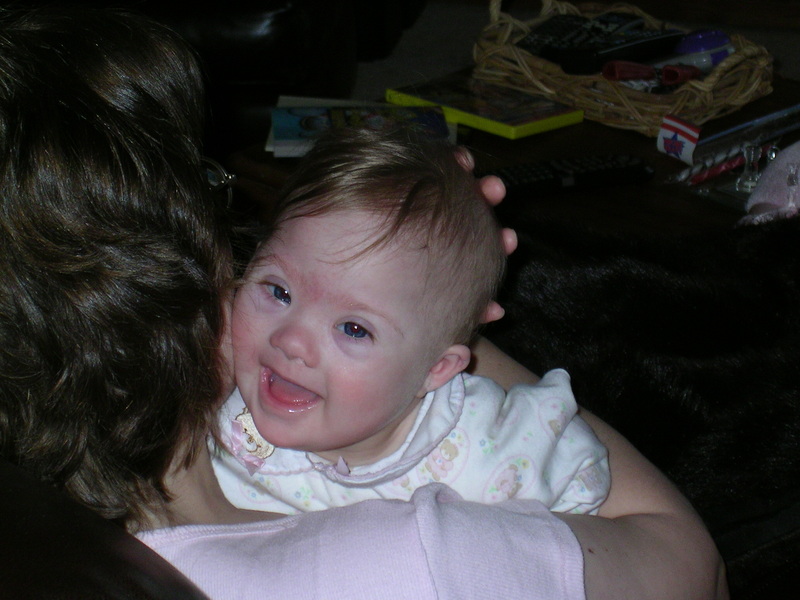 However, upon her birth we promptly learned our baby was born with Trisomy 21, most commonly known as Down Syndrome. 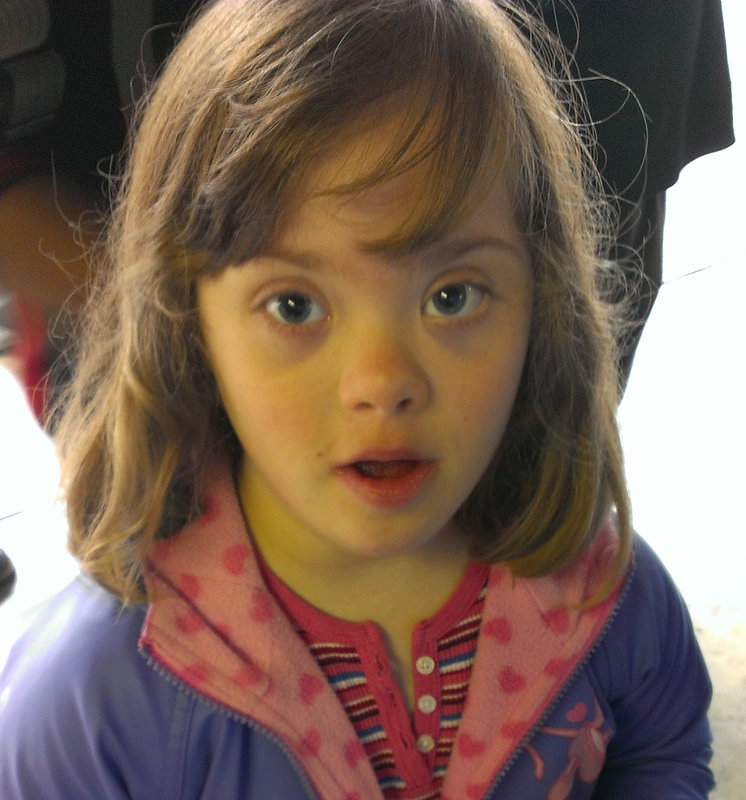 In my grief I found some comfort in knowing the type of Down Syndrome she has is the mildest form and thus we could anticipate she would be very high functioning; we had every reason to anticipate she would be mainstreamed in public school as well as possess the potential to pursue some college. Little did we know then that she would also suffer the effects of a form of Autism. Until a person has full time care of a child with Autism, let alone a dual diagnosis, you can only try and imagine the effect it has on the primary caretaker. For the past ten years my husband has gone off to work five days a week, leaving me at home to care for this special needs child. He spends his day working for a company performing job responsibilities that he loves. Sure he has days when things get stressful, and he has to deal with occasional frustration. But at the same time he works with adults where he is able to enjoy that type of association, and he performs job duties where he not only is he rewarded financially but of equal importance he is rewarded mentally and emotionally. While he is away from home during the day performing his labors and the subsequent rewards of doing so, I’ve been at home day after day, hour after hour, month after month, year after year tending to, caring for, and dealing with the needs, demands and behaviors of our dually diagnosed special needs child. When she was a baby and toddler, while there were still the sacrifices to be made that come with parenting any young child, it really wasn’t that complicated. She was not a demanding baby so, for the most part, life was reasonably calm. I was able to take her with me as I went about doing many of the things of my life. I went shopping, got my back adjusted at the chiropractor, was able to go walking as she happily rode in a stroller, and could visit with an acquaintance. Then, about the time she was four years old, she began to make it known when she didn’t care for an activity. Typically this was done by throwing a tantrum. My most memorable is the time I was trying to shop at a Kohls department store. She flopped herself down in an isle and refused to get up. I had to haul her out of the store while strangers looked on as she was kicking and screaming. I was embarrassed and frustrated and soon began curbing my activities as it got more and more difficult to go out. Being intelligent as she apparently is, she soon learned she could control our activities via her behavior. As she continued to grow taller and heavier it got to the point where I stopped going out of the house with her unless I had another adult with me because, physically, I simply couldn’t handle her on my own. More and more I’ve felt frustration of becoming like a prisoner to my own home because of my child. I’ve tried to make the best of the situation by keeping busy with projects at home, such as interior decorating and taking on various activities to that use some of my talents. Years ago I would go into the city with Brian, leave him at the office and take the car to go shopping. Once shopping was no longer a viable option at least we were able to occasionally go to his office, with Brian, and hang out in an empty conference room. Just doing this made for a nice break for both Elayna and me. It was something different from being home, isolated in this extremely small rural living that offers nothing by way of entertainment. But about a year ago that option came to an end when the company Brian works for moved to a different building and changed the rules in regard to visitors. At present, it would seem, my life is very out of balance. I’m frustrated and unhappy, and Elayna is becoming more temperamental and sometimes stubborn and otherwise difficult. Our dining table is sitting on the patio because we, in ignorance, purchased a dining table with a decorative cut out groove, that has proven to be a major food trap. It is a real pain to clean. I determined I could fill it with a polyurethane stain thus preventing this food trap major pain clean up problem. Last evening, while it was drying, I’d left the can of polyurethane stain on a pad in the center of the table so that I could lightly sand the surface one more time and apply a final coat. In the meantime I was inside washing dishes when I learned Elayna was in the backyard playing on her swing set. A short time later my adult daughter informed me there was a problem outside. It seems before coming back inside Elayna had tossed that can of polyurethane on the patio. The lid was not secured well enough so the remains of the can of dark brown stained polyurethane was now oozing into the deep grooves of our stamped patio as well as being splashed on the house siding. Thankfully my hands were already protected with rubber gloves, from dish washing, so I called to my husband to help as I began mopping the mess up with rags and newspaper. During the clean-up of this disastrous mess, (most definitely not the first of the past ten years) I began to verbalize my frustration. In there I expressed how I didn’t want him to leave Elayna home with me the next day. She’d given me a hard time all day already and I’d just had enough. To say I was exhausted is an understatement. Somehow Brian took what I was saying and determined I no longer wanted to be Elayna’s mother. I’ve not said so, and in my heart I don’t feel so. But my love for my child is at war with my depression and massive caretaker burnout. I NEED HELP with this job and I’m NOT getting what I need. Despite my knowing that Brian takes every spoken very literal, thus despite better judgment, to his accusation/question that I no longer want to be Elayna’s mother, I replied “I’ve been telling you that for a long time”. In reality that is NOT what I’ve been telling him for a long time, but because my words seem to fall on deaf ears, or at very least what I actually say, the cry of my heart, is never heard, I sometimes, foolishly, verbally agree to what he thinks he hears. For me, it at least means he’s hearing something! But, it would seem that comment really brought a truth to the forefront in a way I didn’t expect. For some time now I’ve, on occasion, made the comment that I think the only thing that keeps us together is our child—due to her actual need for both of us. He needs me to care for her during the day so he can go to work which provides us all with income, which translates into meeting our monetary needs. But once he believed, in his mind that I, literally, no longer wanted to be her mother, its likely something majorly switched with him. Initially I just thought I was angry, but later as I sat on the sofa by myself, reflecting on his attitude and words as Elayna was being tucked into bed, I had this feeling accompanied with the sharp realization that, unlike back when I was first pregnant and Brian offered to adopt out the baby if I really didn’t want it, now it was definitely the child over me. Let me be very clear on this… I am not, nor would I ever ask him to choose between me and our child. I don’t and I won’t set up ultimatums where he has to “choose” between us. When I was pregnant I had every intention of keeping my child. And I want her to always feel secure in her place as our beloved child. It was in the early ‘70’s that I was first exposed to the song. One of my mom’s youngest brothers had come to stay at our home a short period of time after graduating high school. He was excited about this song and artists he’d discovered and was sharing the music with my mom. The song was “The Sound of Silence” by Simon and Garfunkel. Hence the beginning of my love and appreciation for Simon and Garfunkel and all the beautiful music they created. However it would be many years to come before I would fully appreciate the meaning behind their words. While I’ve had many seasons of sorrow in my life, the most profound, to date, began July 15, 2004. I was two and a half years into my second marriage. This day found me, my husband, my son and a few extended family members at the maternity ward of the hospital, eight days prior to the originally scheduled date, for a caesarian delivery of the baby I was carrying in a breach position. This pregnancy was not something I’d have written into my life plan, but I do believe, for reasons I still don’t clearly understand, it was a part of Gods plan. At the time of this baby’s birth my youngest child had just celebrated his 15th birthday. My firstborn was stationed in Germany, serving as an Intel Analyst in the Army. Prior to this pregnancy I’d had visions of pursuing the college degree I should have pursued as a youth, but didn’t due to fear and the programing of my upbringing. As he had no children from his first marriage, my husband was ecstatic about the forthcoming birth of this child; his one and only. I cried the day it was confirmed I was pregnant; mine were not tears of joy. My husband, on the other hand, was so excited he had me use four pregnancy test strips—just to be sure. Perhaps in part due to my husband’s delight over this surprise in our lives, I soon warmed to the idea of another child, despite the life changes I knew were ahead of me. Due to a curious experience I’d had when my son was only a year and a half old, I was convinced this child would be born a girl. As with both previous pregnancies, with this pregnancy I was careful to eat healthy and abstain from anything that could or would be harmful to my unborn child. Aside from feeling horrifically nauseous the first few months I had an uneventful and otherwise “normal” pregnancy; that is until the last few weeks when the baby wouldn’t turn into the birthing position. I was given the option to allow the medical people to attempt turning the baby. I opted to forgo that procedure because, no matter who I spoke with, no matter what I read, I did not feel good about that option. July 14th I went to my scheduled doctor appointment, after experiencing some pains the day before, and learned that “this baby needs to come now”. So it was the date for her delivery was moved ahead by eight days and we were to the hospital on time that July 15th. My darling baby was brought into the world and promptly whisked to the nursery without my even being able to look at or hold her. While I was on the delivery table being sewn up, the pediatric doctor and my husband came to where I was lying so the doctor could informed me she suspected our baby might have Down Syndrome and gain my permission to run some tests. In the moments to follow my body went into shock. No matter how many warm blankets, no matter how many reassuring words a nurse offered, I couldn’t stop shaking. I didn’t need them to run any tests, I already knew. While I didn’t realize the significance as they happened, during those nine months of pregnancy I saw children with Down Syndrome practically everywhere I went. I swear I saw a different special needs child about every time I went to Costco. One day I stopped at a crosswalk to let a group of kids, accompanied by a few adults, cross the street. All of the children had Down Syndrome. Just prior to my baby’s birth I spent time researching for reasons she might be breach. One possibility suggested Down Syndrome; an option I quickly refused to accept. Of those moments after her birth, it was then that I then knew. I think it was day three of her life Brian accompanied Elayna for her first hearing test. As I sat alone in the hospital room I sobbed the tears of a broken heart as I cried out, silently, to God, telling him this was the hardest trial he’d ever given me. In that moment I truly believed this to be so. And so began a time of silence in my life. While I did not cut myself off from God, I did close off from the world. We’d been living in the city close to shopping and the many other perks of city life I so enjoyed. Three months after Elayna’s birth we moved into a house in a very quiet, rural, migrant farm workers town. The house we purchased backs up to farmland. While I didn’t realize it at the time, we purchased solitude and silence. Many are the hours I spent rocking in a chair, holding my infant child as I gazed out across that fog laden farmland simply absorbing and relishing the quiet. No longer did I listen to beloved music contained on dozens of CD’s. The TV remained off during the day. I no longer phoned my favorite sister in law for weekly chats. Brian was away to work most of the day; my son spent his days at school; Elayna and I spent our days at home in the solitude of silence; a reality I didn’t seem to be aware of for the time I experienced it. Because my child hadn’t died, I didn’t recognize, at the time, that I was grieving. Because I didn’t recognize I was grieving, it wasn’t until much later I came to see and understand the months and years to follow served as a time of healing. I don’t fully understand how, nor do I understand why; I just know that it did. It was an early summer day when I recognized I’d crossed the abyss and was ready to come back and dwell amongst the living. On this particular day, as I stood at our patio door watching my little toddler joyfully playing outside amidst the wonder of God’s creations, I recognized within my heart this incredible feeling of love for my child. I assure you this was absolutely not the first time I felt the love I have for her, but there was something uniquely different about my feelings just then. In that moment I’d come to a place of true peace about her disabilities, and I realized how much I truly loved her just as she is. I recognize now, I’d come to a place where at last I could place my hand and my heart, in an act of trust, in God. While I didn’t, and still don’t, understand his purpose in creating my child with Down Syndrome, a condition further complicated with the effects of Autism, he is in control, and I can trust him that ultimately all will be well. In the meantime, I had found acceptance with what is; I was at last at peace about it. Beginning that day and in the years to follow, despite the inherent challenges of raising a child– let alone a child with special needs requiring additional effort and infinitely more patience on the part of her caregivers; I can find joy in living. Our house has long since been filled with music; with laughter; with energy and fun. Our time of silence had passed; a time that served us well in its intended purpose, until we could leave sorrow behind and find our way back to joy. By nature I have a disorganized mind; I have multiple thoughts flowing at one time and even the slightest distraction can take me off in another direction in a nanosecond. This might be challenging enough if I lived in solitude. But, at present I live with: my spouse; two adult children; my “baby”, a pre-teen daughter who has Down-syndrome and Autism; my 9 month old granddaughter, whom I babysit while her mother finishes her senior year of college. And the females keep me in constant distraction; all three of them. As a child growing up, I didn’t recognize being different than any other children. My reality was comprised of: being easily overwhelmed by a messy bedroom to the point I simply couldn’t take the project on without help; lying on the grass, in summer, for hours at a time whilst staring up into a gorgeous blue sky watching clouds float by; being perpetually late due to a combination of too many distractions, both in getting ready for and along my walk to school; suffering constant reprimands for “dawdling”, “daydreaming” and the like. I thought this was a reality everyone shared; it wasn’t until adulthood I learned differently. In the meantime, due to the demands of life, I learned ways and means of functioning and managing my time so as to get on well with the world around me. Learning to keep my exterior world and surroundings organized helped immensely in coping with my very disorganized interior world. Actually it is when my son was in first grade that I learned about ADD (Attention Deficit Disorder). Not ADHD mind you; like me he does not “suffer” with hyperactivity. (Sometimes I wonder if it would be helpful if I did). Thus it was, even though he is my second child, and the first does not have ADD, I didn’t think anything of the way he seemed to process life; it seemed perfectly normal to me. Apparently his teacher thought otherwise. Thus it was she who proposed he had ADD and informed me there is medication for it. However, to know me is to know I’m very conservative when it comes to drugs. In consulting with a friend I was informed there are nutritional supplements that are useful in helping treat such conditions, so we chose to forgo the drugs and try the nutritional stuff instead. While I have every confidence our brain needs proper nutrition; and, I’ve learned, adequate sleep, I’m of the conclusion nothing will “cure” this unique way of processing. In the meantime, I’ve taken on the belief the way our brain works, (those of us who process in the manner to which we’ve been given the label ADD), is not necessarily a “bad” thing. When I first sat down to write my thoughts were more or less to point out that where I have such a cluttered mind I “NEED” to live in a very organized environment to function at maximum efficiency. My first husband was, and likely still is, a very organized person. In that regard he was a real compliment to my life. It was never a struggle to keep our living environment neat and tidy and organized because his organizational skills paved the way for me to be able to keep our home that way. As for the yard and garage, he took care of that so I didn’t even need to think about it. It’s a shame there was that other “thing” of his, the “thing” that made it so I simply could not continue living with him. Before my youngest child was born, a child with my current husband, I had both time and energy to keep a neat and semi-orderly house; this being managed despite the odds against me. In the past couple years, and especially this last year, I’ve found this to be a losing battle. In the past couple months I hit a point where I simply gave up and waved the white flag. This is not to say I do nothing all day but blog and play on the internet. I still struggle along keeping up the critical matters of clean dishes, mopped floors, scrubbed toilets, clean laundry, etc. But I’ve stop fighting the clutter perpetrators. You know the people who function on the “let the crap fall, sit, store where it most easily drops, fits, goes” level. How they ever find anything later is a mystery to me. That they marvel to find hidden mysteries lurking below serves to humor me. But most of all, that I am able to mostly turn a blind eye to the chaos without going insane is the most incredible thing of all. Well actually, to be honest, I’ve not turned a blind eye. I still see it; I’m simply choosing to not allow it to make me completely nuts. And while I say I’ve waived my white flag of surrender, this may not be the most accurate depiction of my true intent.